While urban areas across the country contain the highest property values, it’s the suburbs that are often most costly for homebuyers. At least that’s the conclusion drawn by the 2018 Zillow Group Report on Consumer Housing Trends , a which analyzes and compares the costs of buying a home across urban, suburban, and rural areas nationwide. 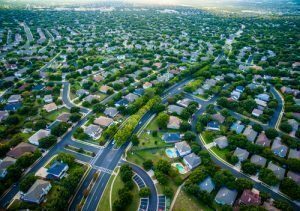 Zillow ’s report shows that homebuyers in urban areas must set aside a larger share of their income to afford monthly mortgage payments in comparison to those buying into suburban or rural markets. Those buying into the urban market must spend 26.5 percent of their monthly income on their mortgage, compared to 20.2 percent in the suburbs and only 13.4 percent in rural areas. The Seattle metro area is representative of this average, where 40.4 percent of median household income must be set aside for urban homebuyers, compared to 27.4 and 24.4 percent for suburban and rural homebuyers, respectively. Nearly half of homebuyers (48 percent) in the top metro areas purchase a house in the suburbs, however, and low inventory in these areas is making that decision more expensive. This accounts for over two-thirds of the current U.S. market, and in some of the hottest markets in the country (17 of the 35 top metro areas), suburbanites end up spending more of their monthly income on their mortgage payments than those living in rural or urban areas. San Diego makes a prime example, where suburban homes necessitate on average 40.9 percent of the median household income—compared with 37.3 percent for rural homes and only 35 percent for urban homes. Other examples are San Jose, Miami, and Las Vegas. In San Jose, suburban homeowners spend 58.2 percent of their income on their monthly mortgage, compared to 53.8 percent for urban owners and 23.2 percent for rural owners. In Miami, 26.1 percent of median household income goes to pay suburban mortgages, whereas urban mortgages average 23.9 percent of household income and rural mortgages 19 percent. Las Vegas suburban owners spend 24 percent of their income on their monthly mortgage payments, compared to 16.8 percent for those living in urban homes. For renters in the top 35 metro areas, the costs are even more pronounced. Thanks to the still-low interest rates for homeowners, renters signing new leases tend to spend a higher share of their income on housing than those who own. Urban renters spend, on average, 36.8 percent of their median household income on housing costs, while suburban renters require 31.8 percent and rural renters only 23.9 percent. In Chicago, renters in suburban areas spend 30 percent of their income on housing, more than in urban areas (27.9 percent). Zillow’s report emphasizes the renter’s plight, highlighting the fact that anything exceeding 30 percent is above the recommended 30 percent. Dallas renters spend 38.8 percent of their income on rent if they live in the city.